Friesians. Most of their milk is still sold to Farmview dairies but they have now diversified after John and Deirdre McDowell's grandson Jose bough supermarket milk home and commented that it did not taste as good as the fresh milk he enjoyed on Hilltop Dairy Farm. Today John and Deirdre's sons James, Phillip, their daughters Alison and Mary and grandson Jose all work and help out on the farm when they can. 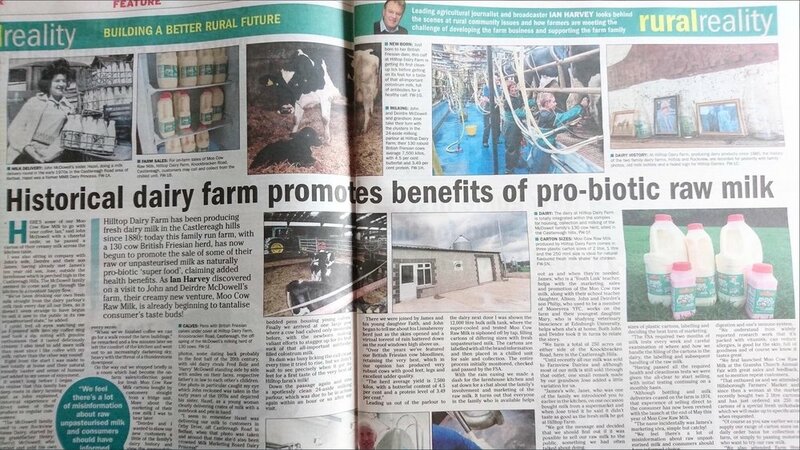 According to the Farm Week article posted below, John and Deirdre say that after doing research through the Department of Agriculture and getting in contact with the Food Standards Agency, they discovered it was possible to sell raw milk. A series of rigorous monitoring and checks were required before becoming licensed. The FSA required two months of milk tests every week and careful examination of where and how they handle the filling of cartons in the dairy, the labelling and handling of the milk. The family dairy passed all the required health and cleanliness tests and were given the all-clear to start selling, with initial testing continuing on a monthly basis. 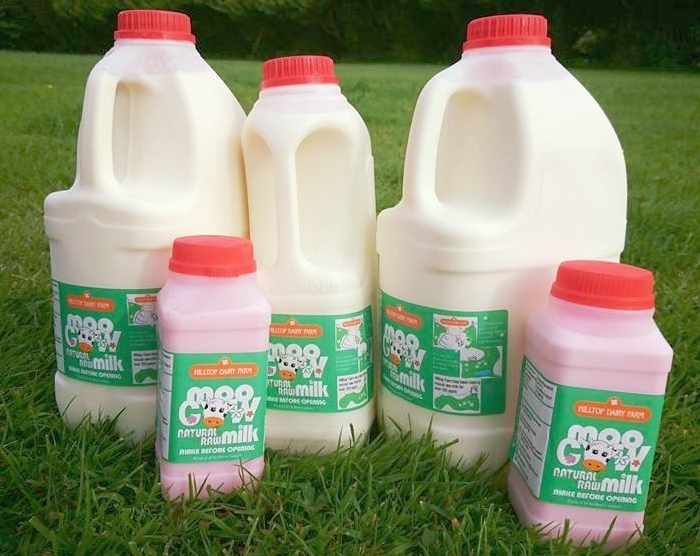 On the 20th of May 2017, the family dairy launched Moo Cow Raw Milk. The milk is sold from the farm gate directly to the general public and also from the local Hillsborough and Inns farmer's markets. John and Deirdre feel there are many misconceptions about raw milk and consumers should have informed choice. They say that nutritionists seem to be convinced of the benefits of raw milk as a 'super-food', a natural pro-biotic, packed with good bacteria to aid digestion and the human immune system. They know from widely reported research that it is packed with vitamins, can reduce allergies, is good for the skin, full of goodness and it tastes good. A recent Facebook post reports: "studies now suggest that children who drink raw milk are 50 percent less likely to develop allergies and 41 percent less likely to develop asthma compared to children who don’t. It can also be suitable for those who are lactose intolerant". Image: a 24 August 2017 Farm Week article about the farm's raw milk, click here to read.